Today, I am so pleased to have author Elizabeth Meyette with me today. Her debut historical romance, Love’s Destiny, is now available for your reading pleasure. Betty, let’s talk historical romance! Hi, Amanda. Thank you for inviting me to your blog today. I always enjoy talking about my debut novel, Love’s Destiny. Betty, give us an overview of Love’s Destiny. 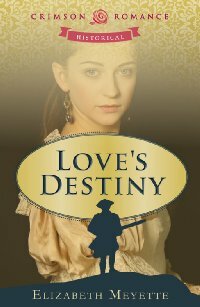 Love’s Destiny is set in colonial Virginia just before the outbreak of the Revolutionary War. 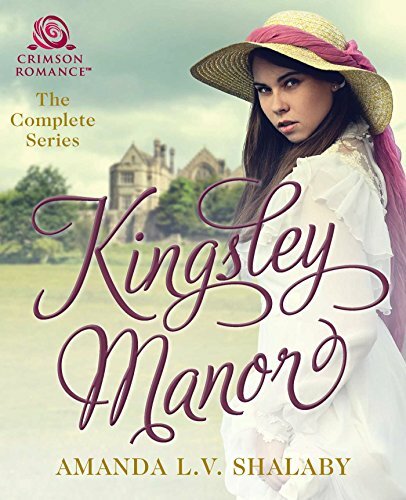 Here is a blurb I’ve used because when people ask for a synopsis, I want to give them the whole story: The simmering rebellion in the American colonies is the backdrop for this smoldering romance thwarted by a dying father’s wish and opposing loyalties. When Jonathon Brentwood becomes the guardian of Emily Wentworth, each expects to meet someone very different. Emily is not the child of her father’s stories, nor is Jonathon feeble and old as she had imagined. Instantly attracted, both try to honor George Wentworth’s dying wish and maintain the relationship he envisioned. While passion overcomes them, their pasts and the future of a young country stand in the way of their love’s destiny. I actually wrote Love’s Destiny on a dare. Many years ago, a friend who loved the romance genre kept urging me to read some of her books, and I kept saying, “Not interested.” When I finally gave in, I read The Flame and the Flower by Kathleen Woodiwiss. Of course, I devoured her other novels as soon as I could get my hands on them, but I didn’t want my friend to “win” that easily, so I said, “I could write a romance novel.” She answered, “Then do it!” So I did, and many years later I am looking at a copy of Love’s Destiny laying on my desk! So Kathleen Woodiwiss certainly influenced me, and more recently, Diana Gabaldon and Nora Roberts. I have to say, though that my new Crimson Romance sisters are definitely having an influence as I read each of their books! When I was writing Love’s Destiny, I just wrote and the characters took me along for the ride. In fact there was one scene that I did not want to write at all, but the characters insisted. Until I wrote it, I could not progress with the book, and the scene worked; my characters were right! What I am finding as I write Love’s Spirit, the sequel, is that the writing flows as it did before, but I get ideas about scenes that will occur later in the book and I have to write them even though the plot hasn’t reached that point yet. Elizabeth Gilbert, author of Eat, Pray, Love talks about divine attendant spirits, or the muse in the wall, that whispers inspiration in our ears. I totally agree with that. There are days when I write like a maniac, and when I read it aloud it’s like I’m hearing it for the first time. It’s gotta be my muse. My husband, Rich, laughs when I say my d.a.m. inspiration is at work (dam=divine attendant muse). And I have found that when my muse is talking to me, I must respect and honor that and WRITE! Well, Amanda, as I have said, I started writing my novel many years ago. At that time there was no Internet or Google, so I was at the library searching through all kinds of documents, books and primary sources. I read a whole book on colonial ships so I could accurately describe Jonathon’s ship the Destiny. I also studied battles, foods, weather, travel times from one place to another…you name it, I researched it, but I love research! I had to set my book aside for a long time as I navigated a divorce, raised my kids, got my teaching degree and taught English. Along the way, when I had time, I would revisit Love’s Destiny and revise. With the availability of the Internet, sites like the one for Colonial Williamsburg makes it so much easier! I even found a “blog” called the “Duchess of Devonshire’s Gossip Guide to the 18th Century”. It’s a hoot! I spent quite a few years single after my divorce and my girlfriends and I would go to singles’ dances together. I want to write a play about four women who do this. My vision is for the set to simply be a ladies room where they sit at “mirrors” facing the audience and the plot is revealed through their dialogue. I believe it would be very funny and very poignant. I have never written a script before, so I would have to learn so much! This has been a powerful image in my brain for a very long time, though, so I hope to write it someday. I am currently working on two books and each is vying for my attention LOL. One is the sequel to Love’s Destiny called Love’s Spirit. It continues Emily and Jonathon’s story, but other characters also come to the forefront. The second book is a romantic suspense novel I am very excited about. Set in the Finger Lakes region of New York State, it’s about a woman who is getting out of a terrible relationship and the only place she has to go is an old house left to her by her maiden aunt. On a recent visit to see family, Rich and I drove through the area on a winery tour. I wanted him to see how beautiful my home state is. The idea for this story formed in my head as we were driving to NY from Michigan, and the house plays a pivotal role in the story. On a highway en route to a winery, there was my house. No kidding! We stopped and took pictures and thus my novel took shape. Hearing that one of the wineries we visited was a haunted castle was the frosting on the cake. Read, read, read and write, write, write! And don’t be discouraged when you get rejections—paper your walls with them because each is one step closer to a contract. Amanda, it has been wonderful to visit with you today. I wish you continued success on your awesome novel, Rhianna. Great interview! I particularly love this bit. “There are days when I write like a maniac, and when I read it aloud it’s like I’m hearing it for the first time. It’s gotta be my muse.” I feel the exact same way sometimes. Love it! Thanks, Jen! Check out Elizabeth Gilbert’s talk on creativity on Ted.com – so inspirational! Great interview Elizabeth and Amanda. I can’t wait to read Love’s Destiny. Someday is here, Lynn! You are a published author! Hi Betty and Amanda! Great interview. I was also inspired by Diana Gabaldon’s Outlander series to start writing. I have a historical romance sitting on the shelf here that I’ve revised a zillion times as I learned writing craft. One day, I hope to let it loose in the world. I love the way you describe your muse. It’s so true, isn’t it, and perhaps only another writer understands when you say your characters have minds of their own, or at least it certainly feels that way. Adding your book to my to be read pile! Thanks, Sharon! Yes, only other authors understand the voices we hear :-). I hope you work on your historical novel – I look forward to reading it! Nice interview, Betty and Amanda.My Nook is supposed to get back up and running today, and I can’t wait to delve into your book. It’s in the batter’s box. Thanks, Becky! I would love to know what you think. I always appreciate feedback from a CR sister!